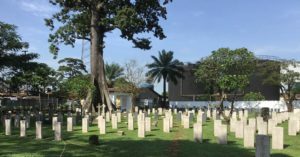 The Commonwealth War Graves Commission has successfully completed the reconditioning of the war grave site at Kingtom Cemetery in Freetown. The site was badly damaged in 2016 when a storm destroyed the barrier wall. Left unchecked, further bad weather could have risked destroying the site in its entirety. However, the Commonwealth War Graves Commission, responsible for the upkeep of Commonwealth war graves around the world, has completed the reconstruction of the protective wall to ensure that the security of the site is preserved. The Commonwealth War Graves Commission was founded in 1917 as the Imperial War Graves Commission to construct and maintain graves and memorials to the almost 1 million Commonwealth servicemen and women who had made the ultimate sacrifice in the ‘War to end all wars’. The cemetery is the final resting place of Commonwealth soldiers who lost their lives defending freedom around the world. The West Africa Rifles, who fought in the Asian theatre during WW II are one such group who fought on the allied side during that conflict. The cemetery is where many WW II soldiers are buried, from across the Commonwealth, with some from Germany. There are 1,856 Commonwealth First and Second World War dead within Sierra Leone. It is also the site of this year’s Armistice Day commemoration, where the site’s re-dedication will be formally declared. An event will be held at 5p.m. on Saturday, 10 November, to which all Commonwealth citizens are invited to pay their respects. 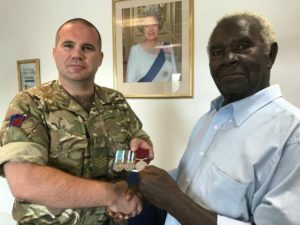 In another ‘reconditioning’ event, Sierra Leonean retired Staff Sergeant, Richard Conteh, paid a visit to the British High Commission to collect his medals, which had been renovated by the UK military. He was awarded again his medals for long service, good conduct, and his time during the Burma campaign.